Historical recreations - American Revolution A large group of Native Americans rush forward into battle. Native Americans and British Red Coats storm through a village. Fighting continues, a few bodies are on the ground. Brief and blurry LS/GV of British soldiers advancing during the American Revolutionary War. CU leather bond book with embossed title reading "Life of Washington", book opens to first page entitled "Valley Forge." Sequence of historical re-enactments portraying the conditions at Valley Forge during the American Revolutionary War: LS soldiers walking through the snow, MS soldiers walking and crawling through the snow, MS men pulling a wagon through the snow, TLS Valley Forge camp busy with activity, MSs soldiers wrapping their bare feet in cloth while in the snow. CU mock Liberty Bell (minus the crack) ringing, this image is then superimposed over an American flag with thirteen stars. CU axe slicing into tree bark. MS Caucasian man and African American man dressed in colonial garb chopping a tree. 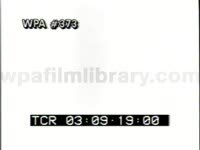 LS men in colonial costume chopping trees in forest. CU black hand and white hand working together to build a log cabin. TLS re-enactment of colonial settlement on a body of water. CU black and white hands working together to build a brick wall. CUs men's faces. LS farm field. MS historical battle ship firing guns at sea. TLS historical re-enactment of African American soldiers fighting alongside Caucasian soldiers during the American Revolutionary War. TLSs re-enactment of tall ship being built. CU wooden mallets driving large spike nails into wood. CUs Caucasian man and African American man using a mallet. Nice TLS of tall ship sailing at sea. CU ship canon being fired. LS re-enactment of ship battle with smoke. MS image of the Lincoln Memorial superimposed over montage of Civil War re-enactments. CU head of Lincoln on the memorial. TLS re-enactment of Western migration showing a wagon train. MS re-enactment of African American man and woman in pioneer clothing riding in the front of a covered wagon. CU wagon wheels moving through mud. First shots are very dark. Historical recreations - American Revolution - Paul Revere's ride MS Man riding on horseback. CU of horse's legs. MS Man riding on horseback. British soldiers patrolling. CU of horse's legs. MS Man riding on horseback. Pan across a battle diorama. CU of horse's legs. MS Man riding on horseback. Historical recreations - American Revolution. British Red Coats with muskets stand behind a barricade. Weapons fire. Some men fall as if they've been hit. Red Coats and Native Americans fighting together. Historical recreations - American Revolution. 3 men with muskets hiding behind some sort of barricade. They fire their weapons. Historical recreations - American Revolution. MS of a stone fireplace with a cooking pots hanging in it. Woman approaches and stirs the pot. Historical Recreation - Revolutionary War MCU muskets resting against wall, first three are taken. MCU from inside structure as window hatch is opened & man points musket out opening. Scenic GV pan of bridge over water. MS men dressed in 18th century non-military early American attire. MS men in non-military clothing of the era walking into brick building with column pillars framing the entrance. 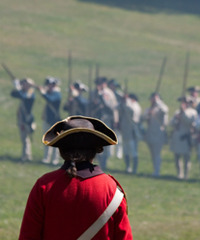 Low angle MS British Red Coats (soldiers) marching along ridge with bayonets, cannons seen in position. 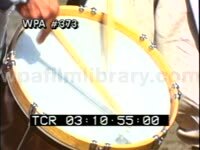 CU drum stick hitting snare drum, pan out to see Patriots in Blue coats calling town Colonists together for announcement. Various MCU/GV Patriot speaking to crowd, having words w/ Red Coat loyalist, loyalist couple is shunned by other town members. CU snare drum roll. LS Blue Coat Patriots line up in battlefield. MCU George Washington talking to General in the field. GV blue coats clearing brush in woods. MCU axe chopping into tree. MCU soil being removed & compacted. MCU George Washington. MS Blue Coats positioning cannon at edge of woods as other soldiers patrol. MS soldiers in civilian clothing hunkered down in woods with muskets in position. 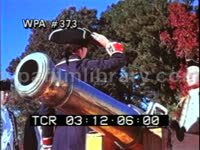 MCU officer saluting while standing next to cannon. LSs battlefield with smoke rising. MS/CU Blue Coat firing musket. GV Red Coat on horse approaching general on the ground. LS battlefield. 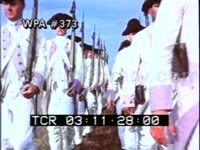 GV Blue Coats positioned behind burn, General stands on ridge w/sword raised calling troops to battle "Charge". MCU General calling "Charge". GV/LS Blue Coats charging into battle. TLS French Gatinois and Saintonge Regiment of Infantry flag bearer in the field. TLS Red Coat soldiers marching w/ cannon in extreme FG & fort in BG. American Revolution recreation. Fife and Bugle corps and drummers in period attire. Soldiers marching. Old flag of France flying from flagpole. Union Jack being raised at fort. Musket rifle being fired, puff of smoke from chamber. Small cannon on wheels firing. British and American soldiers and marching corps. American flag being raised up wooden pole. Recreation of American Revolution. Slow motion old cannon firing. Recreation of American Revolution. 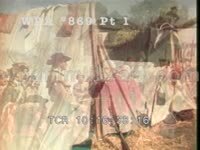 Uniformed Continental Army soldier at tent camp, picking up musket.